Coffee and a Book Chick: The Sunday Salon: My First 5k. Check. The Sunday Salon: My First 5k. Check. That's right, folks. My very first 5k is DONE, son. You may recall a couple of months ago that I started running. 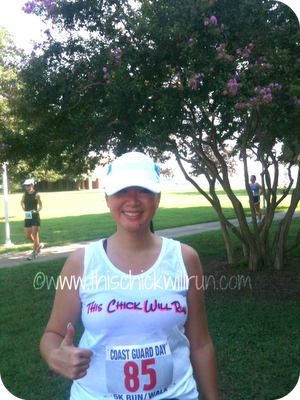 You may recall I then started a separate running blog called This Chick Will Run in order to hold myself accountable. And yesterday, I did my first 5k and had. a. BLAST. I didn't expect to do a 5k so soon after starting running, but I felt that, symbolically, I had to do this one. It was the Coast Guard 5k in Yorktown, Virginia and both my father and husband were in the Coast Guard. I had to do this one. So I signed up for it a month ago, and with my heart in my throat, and my body a jangle of nerves, I showed up today. Nerves and all, I still ran, and ran the entire time even though I was only used to flat roads and there was one hill that made me feel like my legs were sluggishly sloshing through molasses. But the finish line was one heck of a great feeling. I love that the t-shirt has your running blog's name on it! Congratulations! You rock! Woohoo! Congrats on your first 5k!!! You are awesome! Good for you. Good for you! Congratulations on your achievement. Here's my Sunday Salon.I hope you will stop by! I'm so proud of you! I'm more than a little terrified of the half I'm training for (especially when I go out and run 5 or 6 and DIE) but it is all about preparation. Now you will want to do more of them, and longer ones! Congrats! And I love the logo on your shirt....enjoy your running. Congratulations! Such an inspiration to see what you've accomplished this year! Congratulations! That's quite an accomplishment... you are an inspiration!! Yay, that's awesome! And the fact that you ran the entire thing?? Wow!! Yay! I'm so proud of you!!!!!!!! Let me add my congratulations as well, Natalie! What an achievement. I could never NEVER do it, I'm just not a runner though I wish I were. Wow. I'm really impressed, lady. Congrats!! Glad to hear it went well! Congratulations! Sounds like you rocked it! Congratulations!! You'll be running half-marathons and marathons before you know it! U have reason to feel proud. Congratulations. You go Natalie! I am so super proud of you! YAY to the first, and many more to come! Woohoo! I'm so glad that went well. What a terrific accomplishment! Absolutely amazing! Can't wait until I cross the first finish line, like you! Congrats! As someone who just took up hiking a year or so ago, I salute you!!! !